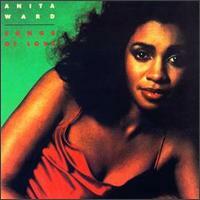 Anita Ward @ Disco-Disco.com ! 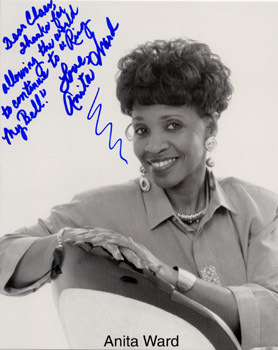 Anita Ward has always loved to sing. Already at the age of 2 she entertained a train full of people with her singing, but it wasn't until she attended the Rust College Accapella Choir she started singing in a more professional way. It was at the College she met her manager, who managed to get her a deal with Juana Records. With the worldwide smash "Ring my bell", she became famous all over the world. This is still today one of the most well known Disco hits of all times, and one of the most popular. But Anita wasn't really into Disco music and never wanted to become one of the Disco Diva's. She actually didn't want to sing that song at all from the beginning, she personally prefers ballads. But her second hit was also an uptempo dance track, a song called "Don't drop my love". In December 20, 1956 a baby girl was born in Memphis, Tennessee - this girl grew up and became Anita Ward with the whole world. This might give you the impression that Anita Ward isn't her real name but as she says herself; "Yes it is. Believe it or not. Most people don't use their real name but my former manager, suggested I used it because it sounded like it worked. So, yes, it's my real name." Anita grew up with music. Both her mother and father, Juanita & James, used to sing and her brother used to sing and play the drums. Anita herself used to sing all the time and she started already when she was very little. She tells me a story her parents and late grandmother used to tell her; "I was 2 years old when my grandmother was bringing me back from Arizona to Memphis because my father, at that time, was stationed in the Air Force, and she said the people on the train called me their little mockingbird, because I sang all the way. So I've always personally liked to sing." This love for singing and using her voice she has brought with her all her life. Discoguy; So, we know you always have loved to sing, but when did you start working with music in a more professional way? "Well, actually, when I went to college - Rust College. They have an excellent choir, the Rust College Acappella Choir. So that's when I really got my more professional type of training. But prior to that, of course I sang in the church and I used to sing though more as a soloist. People always asked me to sing at different churches here in Memphis. But when I went to Rust College, that's when I got more professional... We did all types of music, classical music, gospel, just all types of music and I was usually the lead singer." I've also heard somewhere that you used to be a teacher!? "Oh yes. That is true. 'Cause I have a degree in psychology, so I did finish my college hours and did receive a degree. So how it actually started is that my former manager... at that time he was always taking me to different studios trying to get a contract for me. I got bored once and I asked him 'What can I do while waiting to see what's going to happen with the record?' 'Cause actually I had put out a single that a lot of people don't know about." OH - That's interesting, which one? "One called 'Spoiled By Your Love'. It's actually on the album with 'Ring my bell'. It didn't do that well and it didn't get much airplay, but at least that was the first record I put out. So I asked him 'What should I do, while we wait and see what's going to happen?' and he suggested 'Try some teaching'. And that's what I did and eventually in between the time, that's the way the music life is, you know - it got its ups and got its downs, so eventually I did become a teacher. A fulltime teacher, because, you know, with the music business only - you could starve if you don't do something else. So that's what I did, however now I'm no longer teaching because of my health. It appears they don't even know if I'll be able to teach again as well as anything else, because it's pretty serious. But, the teaching definitely did help me a lot. It was fun." Who was your manager, was it Frederick Knight? "No, Frederick is the one that wrote 'Ring my bell', he was my producer but he wasn't my manager. My former manager was Chuck Holmes. And he is the one who was actually an administrator at Rust College, but he also was involved in music on the side. He heard me sing when I auditioned for a play - Godspell - on the campus and when he heard me, he just liked my voice because it was so unique. I did get the part by the way and after the auditioning he started a tune, 'cause he also was a songwriter, to see how I would sound. And he asked me how would I like to become a recording artist. And that's really the way I got started. So I kind of just started with a joke and I said 'Yeah, sure, alright!' But he was really serious and was going to pursue it, because, a lot of kids would come through this college. If he thought they had a pretty good talent, he'd try to work with them. So I happened to be one of those that went a bit further." "Oh, yes. But unfortunately he died in Mexico in 1981. He was really ill and he was sick even before the record came out, but he passed away." Was it Chuck who got you signed to Juana Records? "Yes, that was Frederick's independent label. I was signed with him but T.K. Records, were the ones who were the distribution company." Yes, I know because I've got both the single and the 12" of "Ring my bell". And the single is on Juana and the 12" is on T.K. Disco. "Yes, it's correct. That's true. So I had everyone taking my money, yes! Hahaha!" "Well, it's true you know. And T.K. was pretty well known, of course you know, at that time. They had several other artists that they had produced, you know, for quite a while." 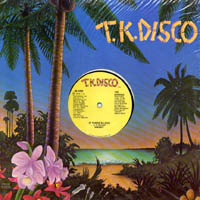 You were recording for Juana, but the 12" singles was released by T.K. Productions in Florida. How was the connection with T.K.? Do you know anything about that? "The connection is Frederick, because he was the one who had the connections with T.K. In other words, he had an independent company, so like most independent companies they had to find a distributor. So he already knew them, I don't know how he had made the connections, but that's what he did. Of course, there were other artists he put out, not just songs for me, but he had another group, a male group... the Controllers. See, he signed them up before he did myself. So, for the artists he had signed, the distributing company was T.K." So you artists of Frederick's, didn't have any connections with the artists on T.K., like K.C. & the Sunshine Band and all of those? "Oh no! First of all, he [K.C.] was right there in Miami, so I'm sure K.C. had a better connection with T.K." But HOW did you get signed to Juana? "Well, it was actually with my manager's persistence and going to different places. The people that he knew at the local small arenas which he had been involved with. He tried to take something that he had got done in the studio. See, he had gone to a studio, a local studio, and put something down with my voice so that they could hear it. And so that's what he used to shop my voice around. So he went to Frederick and Frederick was interested in it and decided to sign me up." When was it you got signed? "Ahh... That actually was probably in 1978 I believe. Yes - '78." Also about Frederick... I heard somewhere, but maybe that was just a lie or gossip, but I head that you were married to him?! "HAHAHAHA!!! That - hahaha - is gossip! Hahaha! I can't believe it. That I was married to him - NO WAY!" HAHAHAHAHA!!! [both laughing] "He was already married, OK!? So, I was not - that is gossip! You know, speaking of gossip, they also said I was killed in a plane crash." "Haha! Thank you, that's right! So I'm saying, people will gossip, but the reason they say that though is because I was in a terrible accident in '81." "No, not a plane it was a car crash." "Wow! Oosh! That's gotta be much worse than a car crash, I don't know, Ohh! But anyway I was in a car crash and part of this problem that's wrong with me now is because of my fracture. My scull was fractured..."
OH! I see... What happened? "It was a small town, I was driving to Birmingham, Alabama. However the crash happened in Tupelo, or close to Tupelo, Mississippi. So at that time they were not as updated as they are today, because I really would have liked for them to have finished... for the car crash to be behind me. I didn't know it would come up again. My head... something needs to be done there, so it [Sinus problem] won't back up and cause me to be as sick as I've been. So yeah, it's pretty serious but I shouldn't think the car crash would come up again. You know, I thought it was behind me, but..."
But things like that can often come up again later on. "Yes, that is true - that is true, you know. I was in critical condition and it was such a very serious accident and maybe that's why they just thought it was a plane crash, but it really was a car crash. But thank God I am here." During the summer of 2000, Anita was in for a surgery for her Sinus problem and everything went great. After just some week she was back on her feet AND was performing again. "Yes, that was 'Spoiled by your love'. It's on that album that 'Ring my bell' is on." Was that the first record you ever worked on? "Yes it was. It was the first one. I had been asked when I was in high school to sign up with a company when they heard me sing for 'Black History week program'. I sang... Oh gosh, how did it go... 'St. Louis Blues', that's it - 'St. Louis Blues'. I sang that song and of course I didn't know that anyone in the audience would be that important. They talked to me afterwards and asked if I would be interested in signing up with them, but my parents being totally illiterate about the music business and I was only 14, so they said 'No way!'. So I'd only been offered a contract, but my first actual recording was 'Spoiled By Your Love'." Then "Ring my bell" was released. 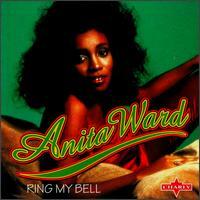 "Ring my bell" is one of the most well-known Disco songs... How does that make you feel? "Ah, you know what? It's some disadvantages to that because, unfortunately I didn't get the opportunity for people to hear me sing ballads... I really love ballads. I really do. That song ["Ring my bell"] is not the type of song that I would have chosen for myself to sing." OK, because I also heard somewhere you didn't like the song from the beginning and really didn't want to record it at all?! "But you know what? At that time they were so much smarter than I, because they knew more about the music business. And if you want something that was gonna get to the audiences attention and, you know, grasp them and something that's catchy. There was nothing else from that album other than 'Ring my bell' that would have done it. So I'm being honest about this and I understand the music business better now. And my voice was often compared to Deniece Williams' a lot, so I wanted them to hear some more ranges of my voice other than something that was a gimmicky sound. That sound was full of gimmicks and it was nice and catchy and it was a song that if some would get the people's attention, that was the one. But originally NO, that is certainly not what I wanted... But, yes, the decision to do that song turned out to be much better because it had a catchier tune, the hook-line." This song, "Ring my bell", have been covered and sampled so many many times. So, What do you think of sampling and covers? Because, just right now, just some hours ago I heard this new version of "Ring my bell" by this English girl called Ann Lee. "Really? I didn't know about that one. OK! Hihihi!" So, what do you think about it? Sampling and covers? "Well, actually I think it's probably pretty good for artists, especially like myself who probably have been forgotten, because it brings back old memories and they think about you, the original singer. But the only problem for myself about sampling, is because I didn't write it. I don't get any royalties from that, so when I hear that someone has done it the only thing that is for me is: 'Oh, there they go again. They thought about Ring my bell.' And that lets you know how catchy that tune must have been. Because everyone, even Will Smith sampled it, I just wished that Will Smith had done that song now, as hot as he is. Hahaha! [both laughing] He did that song a few years ago, about maybe 8-9 years ago. But now as hot as he is, anything he does is going and I just wished he had done it now because of what could happen and that is the good thing about sampling, it creates a desire for those who want to see the original person who originally recorded the song, you know, you might get a call, and get some work. So, that's the good thing about that. Hihihi!" The Ann Lee cover of "Ring my bell" is released in Sweden on the revived SweMix label. A label started by a Swedish DJ/remixer team with the same name, where the late Denniz PoP was one of the leading and most respected remixers. When the label brought the Ann Lee version of this classic hit to Stockholm's hottest dance music radio channel - Power Hit Radio, it got its first rotation only 40 minutes after the station got the record!!! Some versions of the song is mixed by Eiffel 65 of "Blue [Da ba dee]" and "Move your body" fame. Besides for being sampled and covered so many many times, Anita has also been remixed probably as many times. With various results I must add. People from all over the world have made their version of her cult Disco song - "Ring my bell". But in my opinion none of them are as good as the original 1979 12-inch "Midnight mix" by Richie Rivera. There's also a CD album available with different mixes of the song. 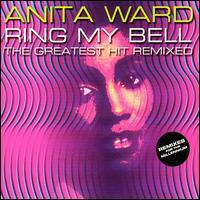 The album is called Anita Ward "Ring my bell - the greatest hit remixed". You also cut this other brilliant single "Don't drop my love", but unfortunately it didn't get the same attention as "Ring my bell", personally I think "Don't drop my love" is equally good. "The problem with 'Don't drop my love' is that it was too high. He [Frederick] had my range much much too high. It should have been brought down some. Because, when I have tried to do that song in concerts I had to either don't do it at all, and it's a very good number, or save it at the end of the show because my voice would be gone after. I'm serious. And when I hear that song it's really really up too high. As a matter a fact I think that's what they, Frederick, did wrong with me - he started the song off high, in a very high range. And if you start off that high you don't have anywhere to go. You've already killed the audience with all of this high range and that's the only problem I feel. Because my husband and I, who has been going on the road as my manager, we brought that song down - my range - and I'm telling you, that beat that's going on - it sounds really really good. It's basically the same beat as going on with the one that you've heard, but I've just got a different vocal, one that's more comfortable for me. And I'm telling you, it really gets the audience up. Yes it does." I'd love to hear that someday... But did you know that Frederick later recorded something like an answer to "Ring my bell", called "Let me ring your bell again"? "You know, my husband found out about that, 'cause he's into computers and I'm the only one that's not. But he looked on the Internet and somewhere found this information of what he had done. But I just found that out a few weeks ago." Anita, Have you ever written or produced some material yourself? "No, I wrote one song called 'You lied' but I didn't, you know, do all the things you're supposed to do in order to make sure you get the rights to it. I co-wrote that but I never did any more - that's the only one. I haven't done any producing. And of course, from now on if I am going to do any records at all, any songs, I'd certainly intend to try to be a part of the writing. Because in that way you can even get more. Just to sing and that's all - then an artist will get the short end of the stick. If you're really smart, and yes, definitely I intend to write as well as try to produce." Anita recorded 2 albums with Frederick Knight for his Juana label. The first album, that included "Ring my bell", was called Songs of love. This album included material written by Frederick Knight, Sam Dees and Tommy Tate. Except for "Ring my bell" [a song Knight originally wrote for Stacy Lattisaw!] the album included songs like "There's no doubt about it", "Make believe lovers", "Spoiled by your love" and "If I could feel that old feeling again". The second album was called Sweet surrender and is most remembered by the hit "Don't drop my love". But there were also a couple of ballads; "Caught between a good thing and goodbye", "I go crazy" plus a cover of a Supremes' song - "Someday we'll be together". Have you still got a copy of your singles and albums? "No! Believe it or not. Actually I gave them all out to relatives. They said, 'You'd better hold on to something. ', but I still have the albums. I don't have anything else. Unfortunately..."
Are these singles and albums the only ones you have made? Or have you done other ones afterwards? "I did 2 albums with Frederick. The second album, the one with 'Don't drop my love', at that time the connection between us had really gotten bad and the song didn't do anything, it did not do well. Then I actually did a third album with a guy out of Mississippi, who didn't have a lot of money, but he tried to do something. He did my voice in a very different range, you know. I sound almost like a, in some of the songs, to me - like a rock singer or something. He didn't have the funds and that album didn't do very well. There's maybe a couple of good songs on there, but it didn't do very well." "Oh yes! It was really, but it was released overseas. He didn't release it here in the US. And that was, how long ago... Let's see - my daughter is 10 years old 'cause I was in the studio pregnant singing, so you know that was about 10 years ago." OK, like around 1990 then!? "Yes! But now I've found out, just recently, that Frederick... when the things between us got bad, in the relationship... He said to my manager, my attorney at that time, that he would work out a deal with me. Because he had put out an injunction against me, where I couldn't sign with anyone else and he said also that I owed him 500 and something Thousand dollars. So he said that if I signed with him again, that I would not owe him that money. So, yes, I signed a contract certainly." "Right! And I want you to know that he actually recorded in a studio about three or four songs and they were really nice songs, but then he didn't do anything with the songs. He just stopped! OK?! And that was it! So, in other words, the contract was null void. Now recently, once again my husband was checking through the Internet, we found out that that stuff is released. Those songs that we did - they're released. They have put them in albums, in other words there's about two or three albums, because he's including the things that were from the 'Ring my Bell' album. And he added them, you see." That wasn't really nice of him. "No, it's not nice. No not at all." Have you ever worked with or been part of any groups? "The groups that I was a part of was when I was in the choir, of course, the Rust College Choir. However we also had a Gospel group that was drafted from the choir, so they were members who consisted of the choir and we would do a gospel section. We traveled throughout the world, the Rust College Choir, so we would do an entire show which consisted of all types of music. They had a female group as well as a male group and we would sing gospel music. So that's the only groups that I've actually been a part of. And we had some problems in that group, I really don't want to be a part of a group again! Hahaha [both laughing] Because, you know, as good as we sounded, I was the lead vocalist so there was partiality being made towards me and, you know, we had problems." I guess that's one of the bad things about groups. "It is unfortunate, I mean, look at what happened with Mary Wilson and Diana Ross. [the Supremes] Mary says 'No way!' and my husband thinks she's crazy. Because, he says it's no way in the world, whatever problems they had with each other, he says for 30 days he could put up with her. You know, for saying 'Ooh' and 'Ahh', he's that cruel. But I told him; 'Well, I don't know - women can be pretty funny.'" Which is your favorite song out of the ones you've recorded? "Hmmm... Believe it or not, I think it's one that the crook went back in his studio and recorded. It's a song called 'Curtains up' and I probably shouldn't tell you about that, 'cause you probably don't know about those songs. It's a ballad and it's really nice. But of the one's that you do know about it's probably a song about.. Oh, what's that song called, I can't think of it now... I'm sorry, I can't think of it now. It's not like I listen to this every day or something, you know. Haha! I can't think of that song or anything now, but it was pretty good - from the second album." Have you got some other favorite song, but that's not by you? "Whitney Houston of course. She has so many songs I like. Who ever writes for her, they're really know what they're doing. She has several that I like. I think her voice, and now I'm going to say used to be fantastic, I don't know what's happening with her now... She has a fantastic voice but it's just like something has happened. But nearly every song she has put out and the one I really love is 'I'll always love you'. If she never sings another song, she sung that song like it would be the last one. She did a great job on that song. Oh yes! Also too I'd like to mention Luther, Luther Vandross, he has a wonderful voice. Because he did a song, he did it on the Happy Image Award. That's an award they give to artists who have been wonderful through out the years. Then when they give an award to someone, they will have someone to sing their song prior to giving them the award on stage. And Luther, who incidentally is so tiny now until I worry about him. He is so small, you can nearly see the bones and I don't know what's going on. But it didn't stop him from singing well, I'll tell you that much. But he sang, they were giving a tribute to... What's his name... Smokey Robinson. Luther did his songs and he did a song so well, it was as he was the best person to do Smokey's song. Believe me." So, if we get into talking Disco songs, is there any song by another singer you would have loved to sing yourself? "Probably 'Knock on wood' by Amii Stewart." Yes, that's a good song! "That was a very good song. Yes it was." But did you like Disco music during that era, or was it more like a job to you? "It was a job to me - Yes. Hahaha! It was a job to me, I just thought it was a job. And eventually other people thought it was a job too." "Yeah, but see that's what I didn't like and I wanted to mention that earlier 'bout how did I feel about that song. [Ring my bell] It tears you up into one particular category and that's just not good. 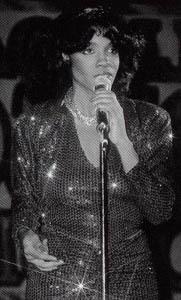 People like Whitney can sing anything she wants to, you know, you want to be able to be classified as a good singer, semi good or something like that - Not that you are a Disco singer. That's what I did not like at all. Because for a person that didn't even care about Disco, to be called a Disco singer and that's all. I just think that locks you up into a category and people don't think you can do anything else." I can see the problem there. "Yes, that's what she told me." Probably that's because both of you have this special, little light, voices. Have you ever been "mixed up" with her or someone else? "Eh, No! Not really which is probably good if they saw... If you mean on a show or something..."
"You mean, someone asking me if I was someone else?!" "The only person they've confused me with is - Deniece Williams - because of our ranges. The first song Deniece put out, people who know I was trying to record stuff, they thought that was me. They really thought that was me singing, but see the thing is, she has more vibrato in her voice than I. My notes are straighter than hers, but people who are not musicians, you know, the audience listening, yeah they would confuse us. But she's the only one that I know of." Discoguy; What kind of music do you personally prefer? "Songs such as the ones that Whitney does, not if they're all ballads, but they just got a nice deep. Songs that Luther sings, which are mostly ballads. Stuff that Deborah Cox do. It's quite a few artists that are out now, as a matter of fact I'm kind of glad, 'cause it seems like the music is going back to real music again." "You know, that is wonderful, so maybe that's why they're sampling our stuff. Haha!" Yeah, I think that the music is going back, it's not just all machines anymore. "Thank you - that's what I think... The guy that did an album on me - that third album that I did... That's also what I didn't like about that album. It was just like machinery, it sounded like it was in a can, it came out and I just, I don't know, I thought this is not it. Not at all, because I think real vocalists, and I do classify myself as that, we don't have to sound like that. Everything just sounded so, you know, mechanical. It did! So you're right, that's what it's been and the rap has lasted so long - I can't stand it. And it's been around... You know, music styles use to last about five years and then it moves on to something else, no-oh - rap has been here since forever, you know. And if it's trying to get away from that a little and get back to more real music - I am just so happy. And then they look so awful with the rap. HAHAHA! [both laughing] You know, they look like they don't have a home, they don't have nothing, I can't take that. Because I think as a performer you should look good on stage, you should dress up. You should really look good!" If you look back on the Disco era now, what do you think of it? "Well, I'm kind of glad that it moved on to other things. I'm not surprised that people got sick of it and started protesting and everything. I don't know why they were, because to me where all the protest is, is in rap and in rock. But unfortunately, because I was having problems with my record label - I, in the mist of that, did not get a chance to pursue other things. In other words, the problems with the company stopped me from coming out with something else, regardless of whether the Disco was going on or not. So, actually, like I told you earlier, I've never been a Disco fan, which is terrible for me to think when the record came out! And it was one of the hottest ones out, but it is not a reflection of my personality. If I hadn't had problems with the label, then people would have gotten a chance to hear other things. As a matter of fact, when I had my single out - 'cause I had the single out, the album and the Disco version out of 'Ring my bell'. And on the back side of the single, there's a ballad on there - 'If I could feel that old feeling again'. As a matter of fact, that's the song that's probably one of my favorites right there, for a ballad. And EVERYONE loves that song. And a lot of people, critics, all the fans would say 'But have you heard 'If I could feel that old feeling again''. So that song really captured people's attention, but there were too many things that was happening with the company, because they [T.K.] even declared bankruptcy and I didn't get any money. And another mistake too, see you're learning from your mistakes. It's like a new job and I had to learn. I was listening to what the ones I thought were professionals would tell me. But I had 22 [!!!] people traveling with me. Did you hear what I said... 22! That is so ridiculous. I had a hairdresser, I mean... Make up... I didn't even let them do things, 'cause I did it myself. That's the way I am. So this person was traveling just to be traveling. And I had several who were, and of course at the end of the month or the week or whatever you're looking for money and you got to call up but I never saw a check. They gave the money to my management firm and they would tell me things such as 'Well, we can't pay you that much because of the overhead.' Of the overhead of which they even says they are the one who have. You know, THEY had those people. But those kinds of mistakes won't be made again." "No, NEVER if I go out again. You know, you just have to be smarter and I was too quiet about what was happening. And also too, at that time you think you've overcome. Let's stay real now... You're wearing these gorgeous outfits that you have paid for and anything you want - they would get it for you. But when you get back home and you can't pay your bills. You see, so that's the ugly part of it, it really is. But as the saying goes 'People treat you the way that you allow them to treat you.'" Have you got contact with any other old Disco acts/artists? "Well, Gloria Gaynor - I've got contact with her and there's a lady by the name of Carol Douglas, that you may not know of..."
"You know, OK! Carol Douglas, let me see who else... Actually I have lost a lot of contact with people over the years. I had prior contact with the Village People. Because when I had gone to Paris I think it was, I was on tour with them. They are the ones who got me connected to TCI Agency. Let's put it this way - they hooked me up with TCI." I'm curious about some other things... After those two albums with Frederick, what did you do after that? Did you go back to teaching or...? "Well, actually, I was forced to if I wanted a job. Yeah, Ha! And know what if you had bills and you need to pay these things. And I wasn't the one, let me tell you something, that some people will say... 'She's the one that messed up because she made all that money.' And then in my case, Yes - THEY made all that money! 'She made all the money and now she's back home with her parents.' So I was forced to go back home with my parents - Yes. You know, because I had a town home which I could no longer afford and a car, I could barely pay the notes on that. You know, when you don't have any income what happens. So, yeah, I was forced to start off once again in the school system and eventually people saw my dedication how I was always on time and I worked hard. 'Cause I don't have an ego. 'It should have been really something to have been all over the world', all the people I've met being back home with my parents would say. But you know, Yes, that's what I had to do. And also I married while I was traveling the first time around, 'cause this is my second marriage, to a guy that, you know, I think - thought he was married to the illusion that he had seen on stage." "Hahaha, you know what I mean..."
"And so, that is against my initial thoughts about him. I was apparently traveling the chitling circuit. The chitling circuit, I don't know if you have heard about that?! The chitling circuit is when you no longer are traveling in the glamorous way as I did the first time." "You're just hot then. That what's I was saying. Traveling in an air-conditioned van, so you know, it's barely... it was just awful. When you go to a place, it's a hole in the wall. You might get the rest of your money, you might not. A lot of times you don't and I really was tired of traveling that way. So, yes I married him, my first husband, despite my initial negative thoughts about him. We were together for about 8 to 9 years, until I worked hard enough to get a divorce. I got the divorce, 'cause he never would have. And you know, Dominique, my daughter, that's her father. But actually he's not, because the man I'm married to now, he is - because we haven't heard anything from him in a long time. So my life now has been set up so I can write a book. Haha [both laughing] No I'm serious. Like most artists - to write a book, THAT would sell better than any records. But, you know, I believe in God, we have to. And never took drugs. You know because, to me when I'm on stage, if I'm really enjoying it, I want to be on a natural high. I don't have to get high from drugs to do well. I love to have the natural high, 'cause if you love what you're doing that's what's gonna come through." OK, Finally - What's your best memory during your years in the business? Have you got some best memory? "I can think of a couple of things. One is when we lived in this place, during the tour the first time around, that was so nice. You know, I'm a down home girl and we stayed in a place, which was like an apartment - it was very nice. I don't even remember where, maybe it was some part of North Carolina or something, I don't know. But we were able to cook and everything, you know what I'm saying. It was like an apartment and it had beautiful scenery out back and it was like getting away from all the things that happened that were part of the music scene. 'Cause if you're on a tour and you sing this every day, you know, you want something different. That's what we did and we stayed there a couple of nights. And my girlfriend was traveling with me also, she was an excellent cook and I'm telling you - that was just really something extra for me personally. And then the next thing, which may sound morbid - I don't mean to sound that way, however it was the best performance I ever gave though. And that was in the outskirts of Mexico City, in Mexico. I think it was called something like a Pharaoh or some name that's hard to pronounce. They had just built this place that was so fantastic and I performed there. It was an Egyptian kind of thing and I mean this place was like millions of dollars to build. So that's where I performed and my manager, Chuck, he died there in Mexico City. So, I did not perform the next day after he died because I was too upset and crying, and I was suppose to perform, I thought 'God, I don't even want to think about it.' But the show must go on, you know, after we did a memorial service for him then the next night I performed. And I'm telling you - I gave the best performance, probably that I have ever given, it was like it was in tribute to him. And another manager that was with me, 'cause I even had other managers traveling with me. It's just as spending money like I really had money to blow and these people were from Atlanta. So this guy that traveled with us, who was really a snob, when Chuck died, then he came over and he never had thought that much about my voice and, you know, my performances. But he came up to me and apologized, and you have to know how this guy is - for him to do this - this was something. And he apologized and he said; 'I've got to be honest, I never really believed in your show. Didn't think you were all of that' he said... 'But lady, you sang tonight like you were never going to sing again.'" That's really some best memory. "Oh yes! That definitely is, even though Chuck died, if there's any way to pay a wonderful tribute to him when he had worked with me and all for so long, it seems like this you know, like you are really that mockingbird that my late grandmother talked about you know." OK Anita, I'm really happy that I got this chance to speak to you. "Oh yes! I'm glad you did too. I has been really nice." "OH - Thank you! I'm honored you would want to talk about my life... Hahaha!" No, I'm honored you that you would consider talking about it with me. Take care now and thanks a lot. In New Years Eve of 2002, Anita was the hostess of a show held in New York's famous Times Square. There were 750'000 people in the audience and 50'000 of them helped out setting a world record in ringing their bells (see where we're coming to...) at the same time. Anita led the group by singing "Ring My Bell" acappella. Then after getting everyone to sing along, the record was set, and the music track began playing "Ring My Bell". Anita started singing, the crowd joined in because the lyrics were shown on the giant screen on the square. She really has this light lovely voice in real life as we know it from her hits - Anita Ward. She recorded one of the best Disco hits ever, even though she never wanted to become a Disco star. But the problems with her contract and her terrible accident stopped us from hearing more from her. From time to time you'll still be able to see her live and you really should take that chance. We love her and I hope we'll soon be able to hear something new from this lovely Lady. to Anita for participating and making this page possible !! !